SICKLE CELL DISEASE : THE AFRICAN SCOURGE! 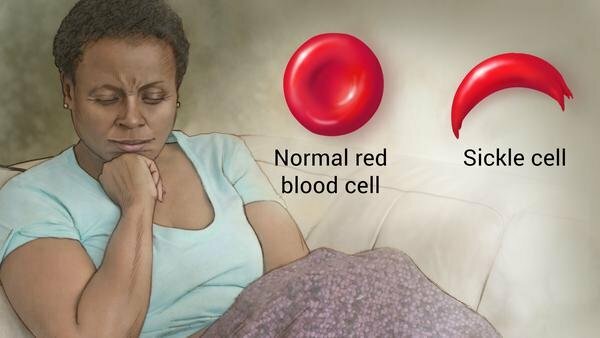 Sickle cell anemia is an inherited blood disorder which causes chronic anemia — a condition in which there are not enough healthy red blood cells to carry adequate oxygen round the body. Normally, the red blood cells are flexible and round, moving effortleesly through the blood vessels. 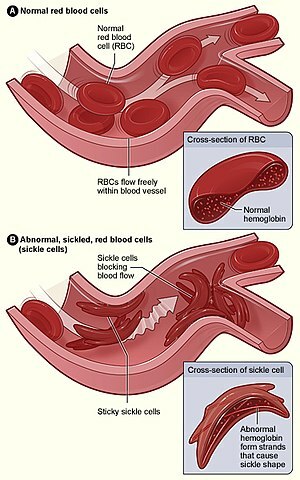 In sickle cell anemia, the red blood cells become rigid and sticky and shaped like sickles or crescent moons. 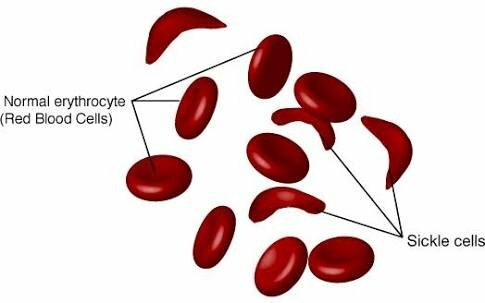 These sickle shaped cells get stuck in small blood vessels thereby slowing or blocking blood flow and oxygen to parts of the body. This inability of the misshapen cells to deliver enough oxygen to the body tissues lead to severe pain and eventually stroke or organ damage (e.g spleen, kidney, brain). This blood disorder is mostly seen among the people of African ancestry and caused by mutations in one of the genes that encode the haemoglobin protein( a protein in red blood cells which is responsible for carrying oxygen throughout the body). In these mutations, the red blood cells are made to take on an unusual sickle shape. The sickle-shaped cells are not flexible and cannot change shape easily. Infact many of them burst apart as they move through the blood vessels. While the sickle cells usually last 10 to 20 days, the normal is from 90 to 120 days. And the body may have trouble making enough new cells to replace the ones lost, leading to the lack in enough red blood cells, and consequently anaemia, characterised by severe pains known as 'crises'. In the United States, most of the people with SCD( sickle cell disease) are African Americans. About 1 in 13 African American babies is born with sickle cell trait and bout 1 in every 365 black children is born with sickle cell disease. A yellowish color of the skin (jaundice) or the whites of the eyes (icterus). Other symptoms include severe pain, anemia, organ damage, and infections. Bone marrow or stem cell transplantation is the only cure for SCD. Due to the fact the transplants are fraught with many risks and serious side effects. Only children with the severe disease are treated thus. Usually, the best donor is a brother or sister. Antibiotics can be used to prevent infections in younger children. Pain relievers are taken for acute or chronic pain. But to stay as healthy as possible, one must ensure that they get regular medical care, a healthy lifestyle, and avoiding situations that may set off a pain crisis. The 2017 World Sickle Cell Day which was celebrated on 19th June with the theme “should you know your genotype” has again reinforced the need for concerted public enlightenment in tackling a major health challenge ravaging homes and afflicting millions with pains and agonies without the hope for a lasting relief. Since this devastating disease is predominantly found amongst the black populace and is said to be responsible for no fewer than 100,000 premature death of infants in Nigeria on an annual basis, it is pertinent and apt to address it, with the aim of finally putting a sledge hammer to it. There should be awareness and enlightenment programmes plus options made available for the treatment, management and prevention of SCD. Also a health policy on the need to examine the status of intending couple's genotypes as a way of preventing or averting unpleasant consequences of SCD. 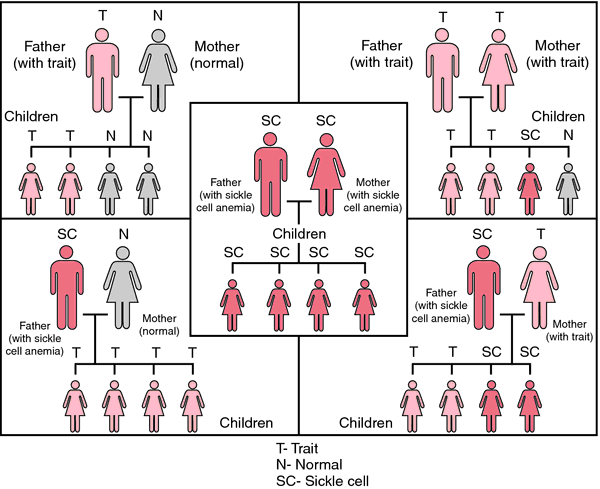 It is important that intending couples know well ahead their genotypes to ascertain compatibility, being made to understand the full implications of the union of a couple who are carriers of the sickle cell trait. Earnestly, the family holds the key to sustaining enlightenment and in ensuring that the youth and future families are properly guided on the marital future that beckon. For not even love can be enough reason to go ahead with a union that will sire mortally agonised offsprings. And we all know the importance of oxygen(respiration). It save affrican from malaria !